"What you need to know when caring for an older cat..."
Concerned about potential elderly cat health problems? You've had your cat for a number of years. He's a beloved companion and family member, and you can't imagine life without him. 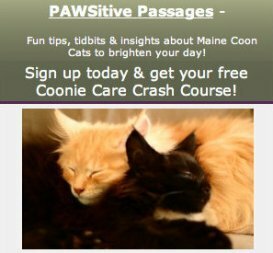 This page reviews possible health issues for your senior cat. As your cat gets older, it's more important than ever to be alert to his needs. Cats will instinctively hide their discomfort. They won't complain, so lets talk about making the golden years happy and healthy. This is one of the more common elderly cat health problems. Just as people get stiff joints, aches and pains, so do cats. It's so important to help your cat get relief from painful arthritis. Keep an eye out for any difficulties climbing stairs, getting on furniture, or just a hard time getting around. You'll know when your cat is stiff, or doesn't seem comfortable. Cats can have devastating reactions to aspirin and acetaminophen, so never give medications without your veterinarian's advice. Chondroitin and glucosamine supplements can help promote healthy joints. As cats age, their muscles will shrink if they're not used. Exercise is more important than ever! Play with your cat, and keep his favorite toys around. Give him places to hide and hunt, like boxes or paper bags. If it's hard for him to get around, consider a ramp for climbing. Set him up with a nice comfy bed on the floor. And keep everything on one floor if it's hard for him to climb the stairs. This includes the litter boxes, which should have low sides. This is one of the more serious elderly cat health problems. Decreased kidney function is something to be on the lookout for with senior cats. Increased drinking and urination. Unfortunately these symptoms don't show up until the cat has lost about 70% if his kidney function already. So, at your cats regular check-up your vet may start some routine blood-work or urinalysis to make sure the kidneys are functioning well. Your vet will prescribe medications and perhaps a diet change. In some cases, fluids need to be administered. And anesthesia becomes more risky, so the kidney function will be checked before this, too. Middle age cats tend to put on weight and become heavier. Then as they get into their senior years they slim down again. Their digestion slows down and fatty foods become harder to digest. This slower digestion can also result in constipation issues. Choosing a quality cat food made for senior cats will help him stay healthy. One of the elderly cat health problems to think about is gingivitis. Gingivitis can occur at any age, but they become more typical with age. Dental problems can cause real discomfort in your cat. One thing you can do to help is brush your cats teeth. If he will let you do it, there are special cat toothbrushes and meat flavored toothpaste at the pet store! Many pets need to have their teeth cleaned at the vet periodically as well. Just as in elderly people, senior cats are prone to hearing and vision loss. If your cat has trouble hearing you'll notice it. At first it might seem like sudden aggression on his part. But he was probably just startled by your approach. Elderly cat health problems include cataracts. If you think you see one beginning to develop, bring it to your vets attention right away. The skin becomes less elastic, and not able to heal as quickly. The coat may become thinner, duller and lack luster. This can be a sign of disease or vitamin deficiency, so if you notice a sudden change, tell your vet. A fatty acid supplement can help with both these issues. It's important to brush your senior cat regularly. Hairballs can be a problem for older cats, and this will help keep them under control. It's also a time to check over your cat for any lumps or bumps on the skin. Senility, or cognitive disorder can affect elderly cats. If your cat seems confused, or if his personality seems to change, this may be the reason. Some symptoms might be howling for no reason, or staring off into the distance. Keeping him mentally engaged for as long as possible will can help ward off senility. You Can Help Your Cat Feel His or Her Best! An experienced veterinarian has written an extensive e-book as a resource for pet owners. It's designed to help you help your cat deal with all these conditions and more, from home. It contains over a thousand home remedies and teaches you how to look after your cats health. You can Click Here to read more or get your own copy. Staying on top of these elderly cat health problems will help make the most of your cat's golden years. This is a time for him to be pampered and treasured. He's earned it!